Volar proximal interphalangeal (PIP) joint fracture-dislocations are not commonly described in the literature; even more infrequently discussed is the nonoperative management of these injuries. The mechanism of injury typically involves an axial load with associated hyperextension of the PIP joint (Kiefhaber and Stern. J Hand Surg Am. 23:368–380, 1998). These injuries can also be referred to as dorsal lip injuries (Kang and Stern. J Am Acad Orthop Surg. 2:47–59, 2002) referring to the anatomic site of insertion to the central slip of the dorsal apparatus of the extensor mechanism in the “dorsal lip” of the articular surface of the middle phalanx at the PIPJ. The classification system typically used for these injuries is stable versus unstable, referring to the examination of the PIPJ following reduction of the articular surface with the joint held in full extension (Kiefhaber and Stern. J Hand Surg Am. 23:368–380, 1998). These injuries, while infrequent, may present similarly to other PIP joint injuries, in a delayed fashion, as a “jammed” or “sprained” finger (Kiefhaber and Stern. J Hand Surg Am. 23:368–380, 1998). Early recognition and treatment of these injuries can improve outcomes. Regardless of whether operative or nonoperative treatment is pursued, the main principles of treatment include obtaining and maintaining a concentric joint reduction and restoration of joint stability and implementation of early motion (Kang and Stern. J Am Acad Orthop Surg. 2:47–59, 2002). Nonoperative management is typically only considered for stable injuries with less than 2 mm of fracture displacement with the mainstay of treatment in these cases being static immobilization (Kiefhaber and Stern. J Hand Surg Am. 23:368–380, 1998). These patients require close monitoring and frequent radiographic follow-up to ensure maintenance of reduction (Kiefhaber and Stern. J Hand Surg Am. 23:368–380, 1998). 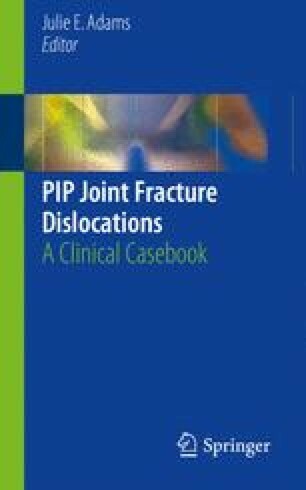 Our case presentation presented in this chapter highlights the clinician’s ability to achieve a satisfactory outcome using nonoperative management in volar PIP joint fracture-dislocations.